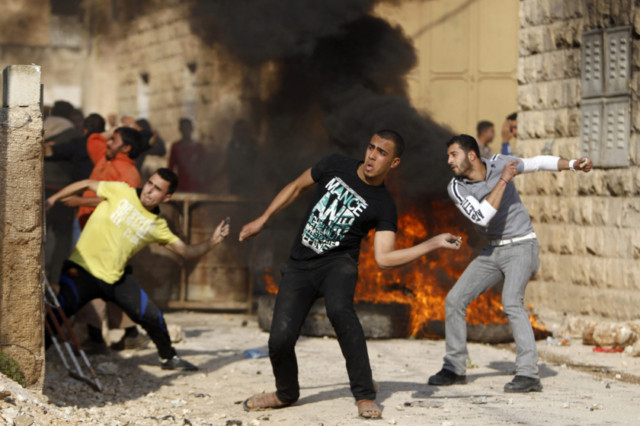 Nablus, Palestinian Territories: Israeli troops wounded dozens of Palestinians in clashes in a West Bank village on Tuesday after the discovery of a small commando force disguised as Arabs brought a crowd of stone-throwing villagers onto the streets, Palestinians said. Palestinian security sources told AFP 30 people in Tamoun village were lightly injured by rubber bullets and one was moderately wounded when a live round hit his hand, while dozens more suffered from tear gas inhalation. They said the troops arrested a local Islamic Jihad member and left with him after uniformed reinforcements arrived to cover their exit. An Israeli military source told AFP that the operation began as covert, then “expanded into a non-clandestine one, according to plan.” The Israeli army’s official comment made no mention of Palestinian injuries. Israeli security officials have noted a rise in the number of violent incidents in the West Bank since last month’s United Nations vote to raise the Palestinians’ diplomatic standing. It also coincided with an Israeli truce with the militant Hamas which ended eight days of fighting in Gaza and southern Israel. Earlier this month, troops in a southern West bank village were forced to abort an attempt to arrest a Palestinian policeman suspected of militant activity when crowds of local residents pelted them with rocks. They picked him up at a later date at a military checkpoint near Hebron.